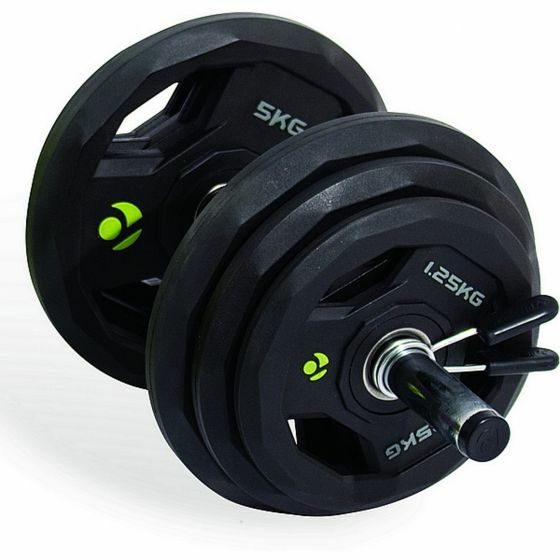 An excellent quality polyurethane set of weights, this 35kg adjustable PU dumbbell set consists of 2 dumbbell bars, 35kg of weight discs and spring collars for both bars to keep the weights securely fastened. Made from polyurethane, the discs are incredibly hard wearing and come with a 2 year warranty. The design of these 35kg adjustable PU dumbbell sets make them incredibly stylish and they are also practical. The PU coating on the discs will not mark surfaces or floors and the bars have an ergonomic rubber handle for easy grip. The dumbbell bars are hollow and weigh 0.6kg each. Dumbbells like these are great for home and gym workouts, so because they are adjustable, they are perfect for beginners or those setting up their own gym that want a wide range of weights but don't have space for a full rack of weights. You are supplied with 4 x 1.25kg, 4 x 2.5kg, 4 x 5kg PU discs so you can have a maximum of 17.5kg of weight on each dumbbell. If you like to use free weights over machines, like to vary your workouts and want some flexible weight sets, then this 30mm PU dumbbell set is great for beginners and more advanced users. With two bars and 17.5kg on each dumbbell, this will provide a range of weights so that you can perform exercises for your chest, arms and shoulders that should stretch you. Building strength via dumbbell workouts is great for control and also engaging additional muscles for stability and control. The dumbbell set also comes with 2 pairs of spring release collars for securing the weights on the bars. Each dumbbell will weigh 17.5kg when fully loaded, plus the weight of the bar (0.6kg).